IR pitcher Abby O’Shields celebrates after a strikeout last year. 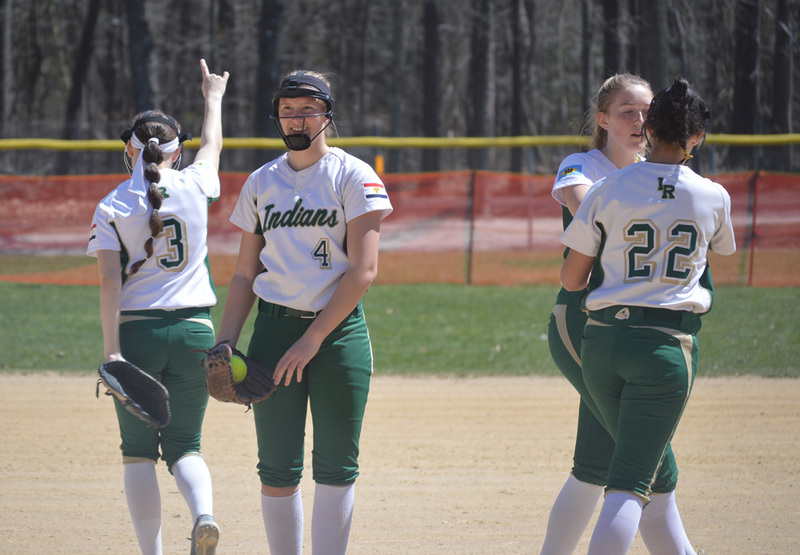 Evidence to prove that came in the very first game of the season, against host Polytech on Monday, March 25, when the Indians gave up a two-run lead in the bottom of the 7th inning, only to tighten things up to pull out a 3-2 win in 10 innings. Senior Abby O’Shields battled the cold, wind and some raindrops late to go the distance covering all 10 innings, allowing just five hits while striking out 18, with just one walk. IR got on the board first, in the top of the fourth inning, when Collins was hit by a pitch with one out. Derrickson came on to run for her and moved up to second base on a passed ball. With two outs, junior Morgan Bomhardt laced a double to the outfield to score Derrickson and give IR the 1-0 lead. It remained that way until the seventh, when IR added what they had thought at the time was an insurance run when Brandi Mitchell — who had singled to lead off the inning — scored on a passed ball with two outs. “Didn’t really know what to expect from Polytech, but I will take my hat off to them, as they have a really good pitcher,” Coach O’Shields said after the win. “It was hard to get a beat on a lefty,” he added of Polytech’s Kaite Burawski, “and I think she will do really well for them this year. We didn’t really hit as well as I’d like, but we battled… we battled. We looked at too many third strikes, not swinging at them. “All in all, though, when it came down to it, Grace Snyder laying down a bunt [in the 10th] to move the runner over to third… the senior leadership of Kathryn Collins, and Abby pitching well — those three seniors really leading us and keeping us focused throughout,” he said of what has made the difference for the Indians. Polytech rallied to tie the score in the bottom of the seventh, when Jazlee Rojas lined a double to the left-center field gap to score Kylie Nagle and Elizabeth Horn. Both Horn and Nagle singled with one out to give the Panthers life. Things remained knotted at 2-all until the top of the 10th inning. With daylight quickly fading, the umpires ruled that the international tiebreaker would be used to decide a winner. That meant a runner — the last out from the previous inning — would start on second base. Snyder laid down a perfect sacrifice to advance Ursula Barrientos to third. With one out, Derrickson hit a ground ball to the right side that was deep enough to score Barrietos with the go-ahead and what turned out to be the game-winning run. Poly had their shot in the bottom of the 10th and had the IR fans who had made the trip north sitting on the edge of their seats. Rojas started on second base with no outs and advanced to third when Hailey Wich reached on a bunt single. Wich then stole second, putting the tying and winning runs in scoring position with no outs. However, O’Shields got Destiny Whaley to ground out to third, Kelsie Burawski to pop out to short, and Kaite Burawski to fly out to center to end the game. The Indians collected just three hits in the game, with Taylor Lipkins, Bomhardt and Mitchell each getting credit for the knocks. Mitchell, Derrickson and Barrientos each scored a run. IR was set to host Dover on Thursday, March 28, in the home opener and yet another Henlopen Conference divisional crossover contest. They will welcome Caravel Academy on Saturday, March 30, for a late-afternoon tilt. Results from the games can be found on the Coastal Point sports Facebook and Twitter pages.